Christopher Eccleston burst onto screens in 2005, instantly winning over fans with his confident, funny, and tormented incarnation of the ages-old titular Time Lord. Unfortunately, although his decision to leave the role after just thirteen episodes probably helped the viability of the franchise by allowing regeneration to be introduced and incorporated so early, it also left the Ninth Doctor as one of the most tragically unexplored incarnations to date. 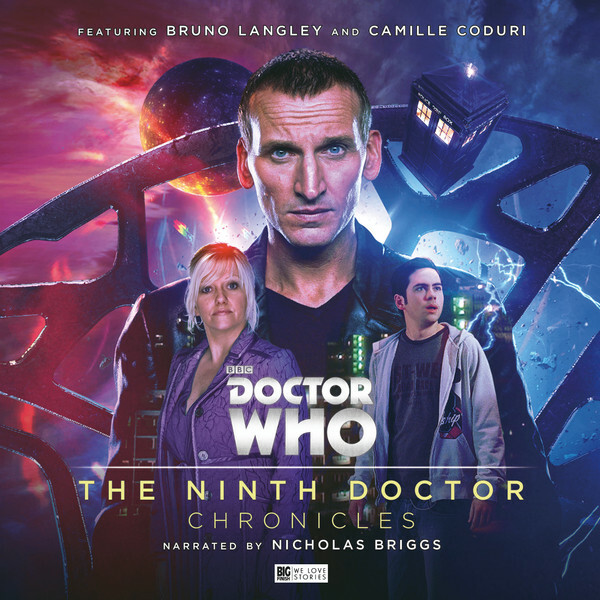 As of yet Christopher Eccleston has declined any invitations to reprise his role, but Big Finish has employed the stylings of its The Companion Chronicles range and Nicholas Briggs’s ability to channel the essence of the Ninth Doctor to once more bring 2005 to life with its The Ninth Doctor Chronicles. Cavan Scott’s ‘The Bleeding Heart’ opens the set, focusing on a very emotional and wounded Ninth Doctor fresh out of the Time War prior to his meeting with Rose. It seems natural that he would seek out a respite following the atrocities he both witnessed and committed in the name of the universe, and a planet of perpetual peace provides the perfect draw. However, when a mysterious death prefaces an increasing number of mysterious and unexplained occurrences, the Doctor quickly finds himself paired with news reporter Adriana Jarsdel as he once more delves into fragments from his darkest days. Claire Wyatt adds a tremendous amount of depth to her de facto companion in a short pace of time, providing a strong anchor for the events around her and setting up her character’s decision for the heartbreaking finale wonderfully. The character of the Doctor here may be a bit too quirky for the harrowing mystery at hand, possibly a façade to hide his survivor’s guilt, but ‘The Bleeding Heart’ overall is a strong link between the War Doctor and pre-‘Rose’ Ninth Doctor that forms a solid foundation for this hybrid format and a great reintroduction of Eccleston’s iteration. Una McCormack’s ‘The Window on the Moor’ returns to the televised era with Rose by the Doctor’s side as the duo stumbles upon Emily Bronte in a tremendously visual and descriptive story. In true Doctor Who fashion, though, the Doctor and his companion quickly find themselves split up, trying to piece together different facets of the same puzzle regarding Ada and Emily as the tale of a strange civil war briskly unfolds across space and stories and storyteller collide. It’s hard to imagine the glass prison and guards coming to life so immersively without the use of narration, but the glorious settings and the windows between worlds lend a fairy tale quality to the grimness and danger that are ever present. This story and its moments of whimsy are somewhat lighter in tone than the first story in the set, but ‘The Window on the Moor’ perfectly reintroduces the dynamic between Rose and the Doctor and effortlessly hurtles through its visual mystery while incorporating some of the true mystery behind the Bronte sisters. Scott Handcock’s ‘The Other Side’ attempts to better explore the character of Adam Mitchell, Rose’s erstwhile possible romantic interest who joined the TARDIS at the end of ‘Dalek’ only to be unceremoniously evicted in ‘The Long Game’ one episode later. Taking place between those two stories, ‘The Other Side’ finds the TARDIS trio investigating the source of a temporal tsunami within an abandoned cinema. With the Doctor quickly trapped in the past and once more forced to confront his actions during the Time War, Adam understands what the prospect of losing the Doctor means to Rose and tries- through all of his awkwardness- to console her as he tries to think of the future. Bruno Langley slips back into the role of Adam easily, and Adam’s brilliance and seeming social discomfort shine as he becomes central to the resolution after Rose is taken to yet another time, earning him a well-deserved acknowledgement of respect from the Doctor. While it’s unfortunate that the Bygone Horde is defeated quite so easily, the threat is immense and wonderfully evocative, yet another reminder of just how devastating the mystery of the Doctor’s past can be. Of course, the Russell T Davies era of Doctor Who is famous for its focus on the lives and families of the companions, and Jackie Tyler gloriously takes centre stage in James Goss’s ‘Retail Therapy.’ Camille Coduri recaptures her much-loved character perfectly as if no time has passed between her stint on television and now. Even while inadvertently taking place in an alien invasion of sorts that eventually highlights the worst of humanity, Jackie’s naïve innocence, her desire to do good, and her deep love for her daughter shine through and provide a great emotional core to balance the unknown Glubby Glub menace. With a bit of tweaking, it’s easy to see this story being used as a sort of template for a Doctor-lite story had that notion been in place during Eccleston’s tenure; as it is, it superbly emphasizes how well-rounded and dynamic Jackie Tyler is, and Coduri is a tour de force from understated beginning to emotionally impactful end. The Ninth Doctor Chronicles may, by its very nature, be divisive since Christopher Eccleston has not reprised his role and since the stories are not full-cast dramatizations. However, full credit must be given first to Nicholas Briggs for managing to capture the essence of Eccleston as well as for tackling so many other supporting roles as needed and then to Big Finish and to the four stories in general for managing to capture the very spirit of the 2005 season so well. With a blend of drama and comedy that can shift between whimsy and realism, the set certainly better fleshes out the short-lived Ninth Doctor and proves to be a successful means of expanding that beloved era, even if the inclusion of narration necessitates that the stories cannot move quite as quickly as on television.